I finally saw Baz Luhrmann’s movie “Australia” over the holidays. I had hoped for better. It was not unpleasant, and the actors do a creditable job. It’s always good to see Bryan Brown (I’ve been a fan since “Breaker Morant,” though it was in “A Town Like Alice” that I really got hooked). He has held up tremendously well over the years, and looked great—which can’t be said for Jack Thompson (the old drunk who dies in the stampede), a major figure in Australian cinema who also appeared in “Breaker Morant” (he was the lawyer) and was Clancy in the iconic “The Man from Snowy River,” among other films. Still a great actor, but he doesn’t appear to have aged quite as gracefully as Brown. The youngster who plays Nullah, Brandon Walters, is wonderful, and Hugh Jackman and Nicole Kidman do a good job with the multiple, often tortuous plot lines, clichés, and twisted history. I’m just sorry that the country Australia wasn’t represented by a better movie. First of all, calling it “Australia” is a bit silly. Like making a movie about the Alamo and calling it “The United States.” Sure, it’s a bit of the country, but it’s not the whole country. The scenery was nice, but often the pans went so fast it was hard to really take in anything. You also didn’t see much of Australia’s variety, and even in the Top End, there is a lot more variety than what was shown. I’m also sorry that history was twisted in ways that were clearly designed to make Australians look bad. For example, the whole plot element of sending children to an island as the Japanese bombers approached is rubbish. Aborigines, adults and children, were evacuated along with everyone else, often being sent all the way to the south coast, to make sure they wouldn’t be in harm’s way. Sure, there were serious issues with the Aborigines (which are not really addressed in any meaningful way by the movie), but sending children and priests to their deaths was not among those issues. As for the Japanese soldiers on the beach, shooting at those rescuing the children—the Japanese didn’t land any soldiers in Australia. It was a surprise bombing run, like the bombing of Pearl Harbor. So pure fiction was added to misrepresentation. Then there were the things that they singled out to make Australia look bad that were in fact pretty universal. For example, not letting Nicole Kidman into the bar and directing her to the separate ladies’ section of the pub. There were, in the 1930s, almost no bars anywhere in the world that allowed women to stand shoulder to shoulder with the boys—and in fact, in my own experience, in England, separate rooms for ladies in the pubs and even some restaurants didn’t go away until the late 1980s. On the other hand, women in Australia had the vote well before women in the United States did. So again, an element is taken out of context with the sole purpose of making Aussies look bad. I still enjoyed the movie. It was Australia, and it included areas where I’ve traveled, so I was pleased to see what was shown. The love story was predictable, but it was still pleasant. Jackman and Kidman are pretty to look at and good enough actors to sell the idea that they were in love. The little pseudo-Darwin they created looked very much like a small town in Australia, which gladdened my heart. But the movie as a whole was out of control. It’s not really true to Australia, the people or the history. I might consider seeing it a second time, for the scenery, but don’t really care if I see it again, and I will not be adding it to my collection of Australian movies. Monument to ANZACs, Albany, W.A. “Erected by their comrades & the Governments of Australia and New Zealand in memory of the members of the Australian Light Horse, the New Zealand Mounted Rifles, the Imperial Camel Corps & the Australian Flying Corps who lost their lives in Egypt, Palestine & Syria, 1916-1918.” So reads the inscription on the wall surrounding the monument pictured here, which stands on Mt. Clarence in Albany. I related a fair bit about the ANZACs—the Australia New Zealand Army Corps, which saw some of the worst of the action in World War I—in my March 23, 2007 post about ANZAC biscuits (delightful cookies that honor the brave warriors). Australia and New Zealand were both young countries when World War I began, and yet they rallied to England’s aid and headed for the Middle East and Europe. The ANZACs sustained incredible casualties—but they also scored some astonishing victories—including the almost legendary battle of Beersheba. Beersheba— in the area known as Palestine, though in 1917 it was part of the great, sprawling Turkish Ottoman Empire—was the key to breaking through the Turkish lines. The Allies, but most especially the British, had fought for months, but the Turkish forces were strong and well armed. The decisive battle came on October 31, 1917, a seemingly doomed effort to take Beersheba before nightfall. The British turned to two regiments of Australian mounted soldiers: the 4th (Victoria) and 12th (New South Wales) Light Horse Regiments. The plan—charge. Have a few hundred Australians, bayonets in hand, simply run their horses over open ground at the several thousand Turks, in trenches, behind rifles, cannons, and machine guns. But the Turks never imagined a charge. They assumed that, like the British cavalry, the horsemen would get off a few thousand meters away and then attack on foot, using their rifles. But this wasn’t the British. The Aussies yelled bloody murder and ran straight at the guns. By the time the Turks figured out what was happening, their cannons were almost useless, as the Light Horsemen were too close. After a dangerous gallop of a few miles, the horses were vaulting over the Turkish trenches. Aussies dismounted, and fighting was now hand-to-hand. The Light Horsemen were still hugely outnumbered, but the charge had demoralized the Turkish troops, many of whom fled. By nightfall, Beersheba had been taken. The movie “The Lighthorsemen” is not the best movie to ever come out of Australia—that would probably be “Breaker Morant,” though that’s about a different war. For movies about ANZACs in World War I, “Gallipoli” is probably more reflective of the grim reality and is better acted and constructed. But if you simply want to be amazed by an astonishing piece of history that is little celebrated outside of Australia, or if you just like heroes on horseback, I do recommend the film. And the battle, while the heart of the movie, is not all the movie contains—there is background, build-up, and even a bit of romance. 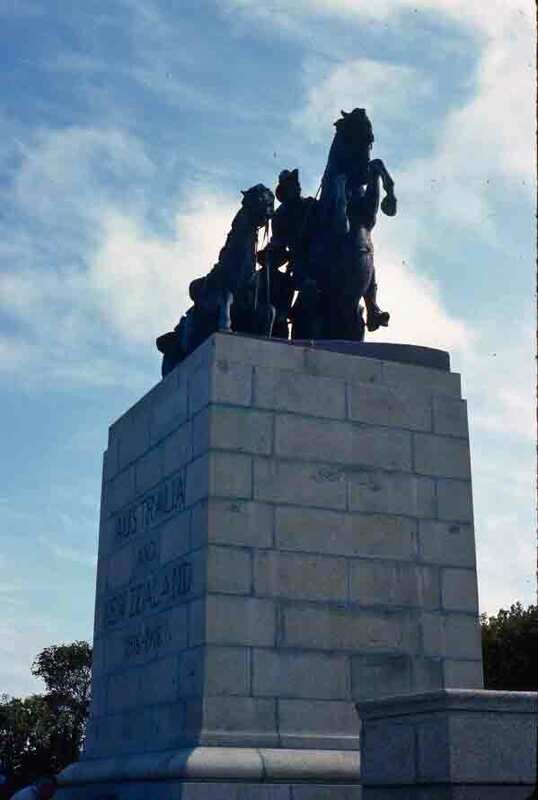 To give you a sense of the film, here is an excerpt–the attack on Beersheba, from “The Lighthorsemen.” It makes the statue mentioned above a bit more understandable. 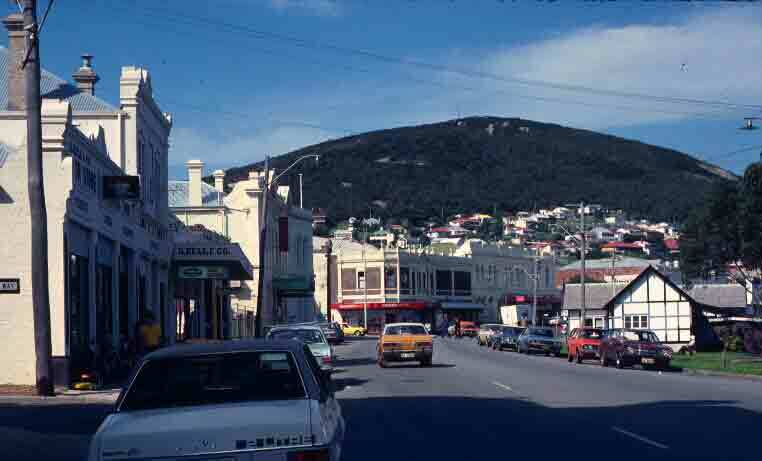 Albany is the oldest town in Western Australia, settled 2-1/2 years before Perth. We spent two nights in Albany, interspersing our floral exploration with bits of local history and natural wonders. It’s a charming town in a beautiful location. The photo on the left, below, is the view from Mt. 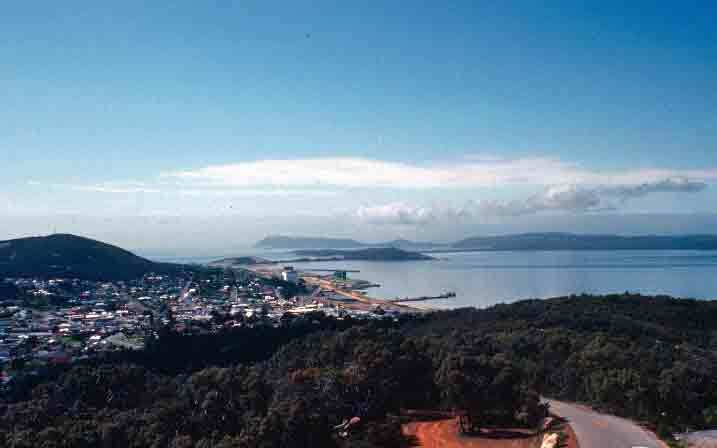 Melville, showing the city nestled amid hills and bordered by the sea. The second photo is near the intersection of two of the town’s main streets, where buildings dating to the 1800s line the road. 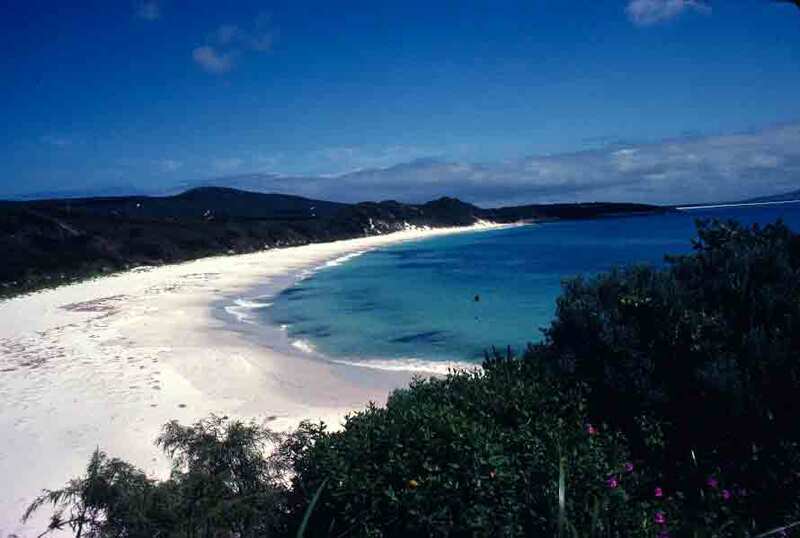 The third photo is of Cheynes Beach. This is the beach near the old whaling station that lured me away to walk on the sand and wade in the water (in lieu of shopping for souvenirs at the whaling station gift shop). I think you can tell from the photo why I’d find this spot irresistible.